We provide with the right kind of services and products for Sleep Apnoea treatment. Sleep apnea is a sleep disorder characterized by pauses in breathing during sleep. The best way to avoid this problem in Neurology And Sleep Centre. this centre provides world best treatment for snoring problems. If Yes, then let us help you to understand more of it. Dr. Manvir Bhatia is a is a Senior Neurologist and Sleep Specialist with > 20 years of experience. Dr.Manvir is Director of Sleep medicine and senior Neurologist at Fortis Escorts Heart Institute-New Delhi and Neurology Sleep Centre, New Delhi. 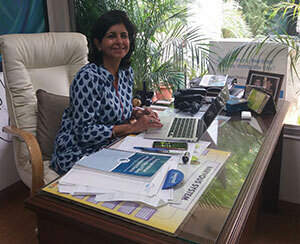 She is currently the Vice President of Indian society of Sleep research. She is the author of the book-“The Sleep Solution” first non-fiction book on sleep, in India. She also started the first sleep clinic and sleep laboratory under Neuro-Sciences at AIIMS. She has been a pioneer in creating awareness about Sleep Disorders and establishing the role of Sleep Medicine in the country. Sleep apnoea is a very common disorder, approx. 6 million adults in India have this but 80% remain undiagnosed and untreated. Join us for World Sleep Day Celebration on 16th March 2019 at Hyatt Regency New Delhi from 10am-5pm. You can call our centre at the number given below or kindly fill in your details in the form given below and we'll get in touch with you shortly. We also evaluate these sleep disorders in our Neurology and sleep centre .